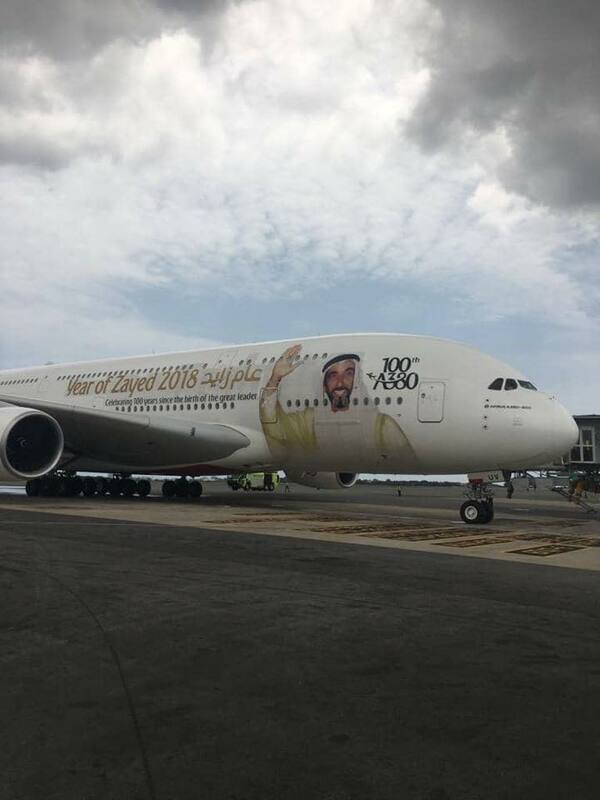 History was made today in the country’s aviation section as the world’s biggest passenger aircraft, Airbus A380, belonging to Emirates Airlines, made a debut touch down in Ghana. 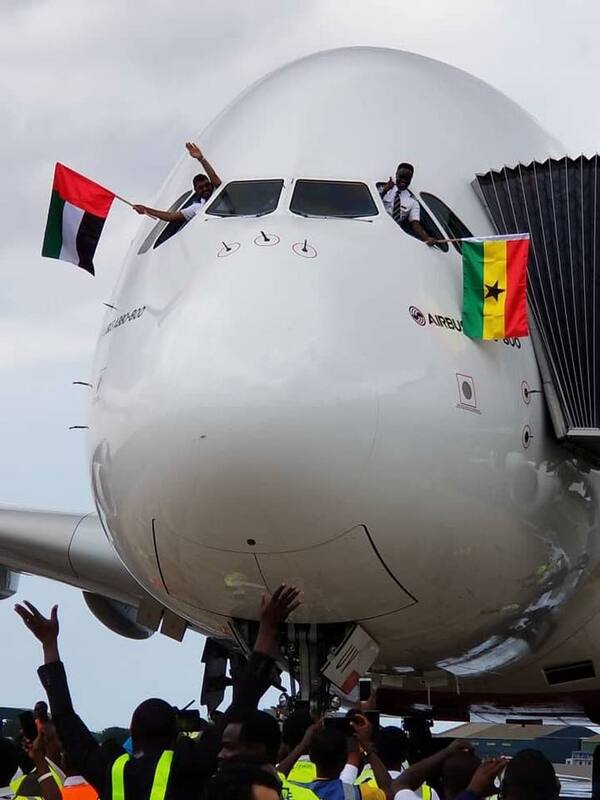 The double-decker aircraft arrived at the newly constructed Terminal 3 of the Kotoka International Airport on Tuesday afternoon to a rousing welcome by some airport staff and Ghanaians including old students of Koforidua Senior Secondary Technical School. 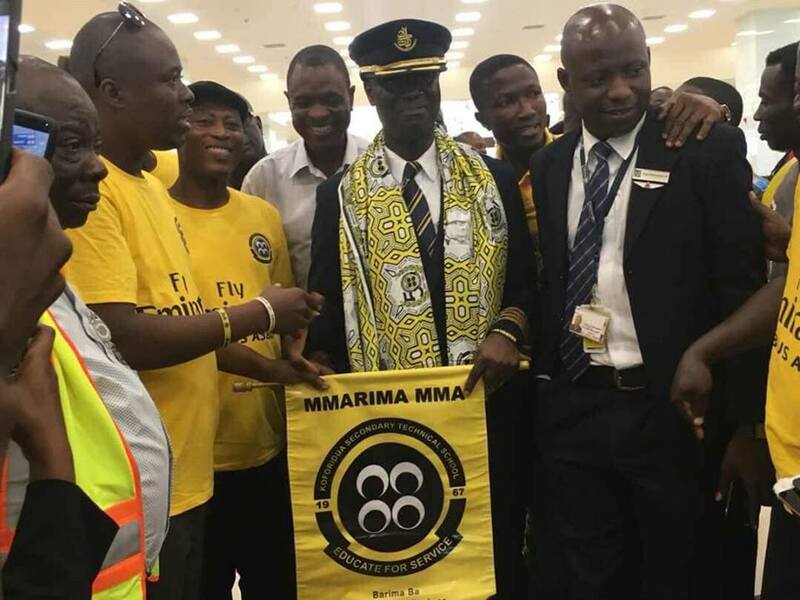 The old students were there to support and welcome Captain Solomon Quainoo, a Ghanaian pilot with the airline and a former student of the school who had the privilege of flying the plane to Ghana. Captain Solomon Quainoo was supported by UAE national, First Officer Faisal Alhammadi in the cockpit. The arrival of the aircraft, although a one-off service, is said to be a demonstration of the capacity of Ghana’s Terminal 3 to accommodate it. The aircraft was met at the airport with a ceremonial water cannon salute amidst cheers and applauds from onlookers. Onboard the flight were top-level officials of Emirates and the government of Ghana including; Orhan Abbas, Emirates’ Senior Vice President, Commercial Operations – Africa, H.E. Ahmed Ramadan – Ambassador of Ghana to the U.A.E, Simon Atieku – Vice Council of Ghana (Dubai & N.E) – Consulate General of Ghana, Akwasi Abayie Adomako – Minister – Counsellor and Deputy Head of Mission Ghana, Hesham Abdulla Qassim Al Qassim – CEO – Wasl Group & Vice Chairman – ENBD. The others are Vinay Malhotra – Chief Operating Officer, VFS, Lt. Col. Ibrahim Hamad Ibrahim Abdalla Al Maazmi – Dept. of Naturalisation & Residency Dubai, Majed Sultan Murad Ali Al Joker – Executive Vice President Corporate Affairs, Dubai Airports. The team was received by Airport staff who together with some journalists toured the aircraft. “Accra is an important destination in Africa and we remain committed to providing our customers in Ghana with the world class services we are known for. The Emirates A380 has been at the centre of innovation, and bringing this popular aircraft to Accra is a significant milestone in our operations to Ghana, where we will soon celebrate 15 successful years. We thank the Ghanaian government, the Ministry of Aviation and the government authorities whose support has been instrumental in making today’s one-off service a success,” he added. 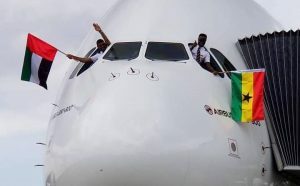 The Emirates A380 to Accra operated in a three-class configuration, with 426 seats in Economy Class on the main deck, 76 flat-bed seats in Business Class and 14 First Class Private Suites on the upper deck. In addition to spacious seats, free onboard Wi-Fi and award-winning in-flight entertainment in all cabins, the Emirates’ A380 is renowned for its First Class Private Suites, Shower Spas and Onboard Lounge for First Class and Business Class passengers, offering a wide range of drinks and canapés, as well as space to socialise or simply relax. 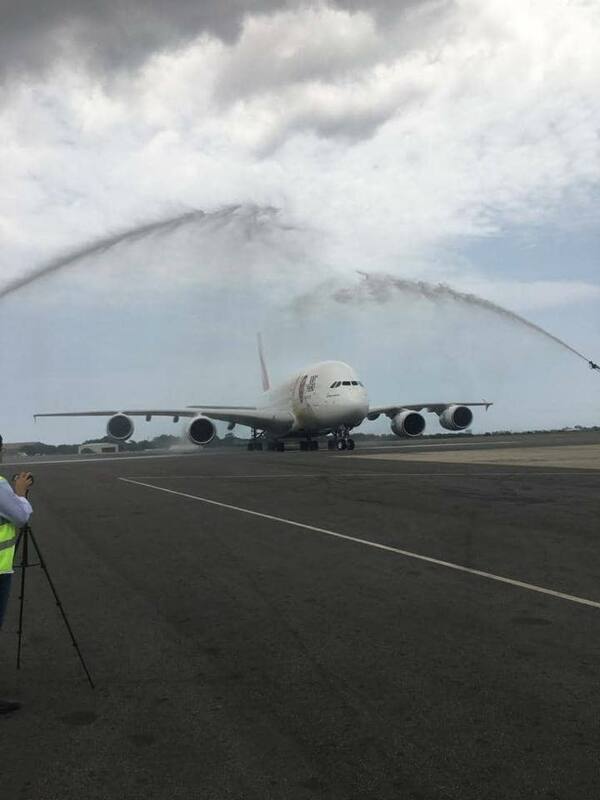 The post Ghanaian-piloted A380 aircraft touches down to rousing welcome [Photos] appeared first on Citi Newsroom.